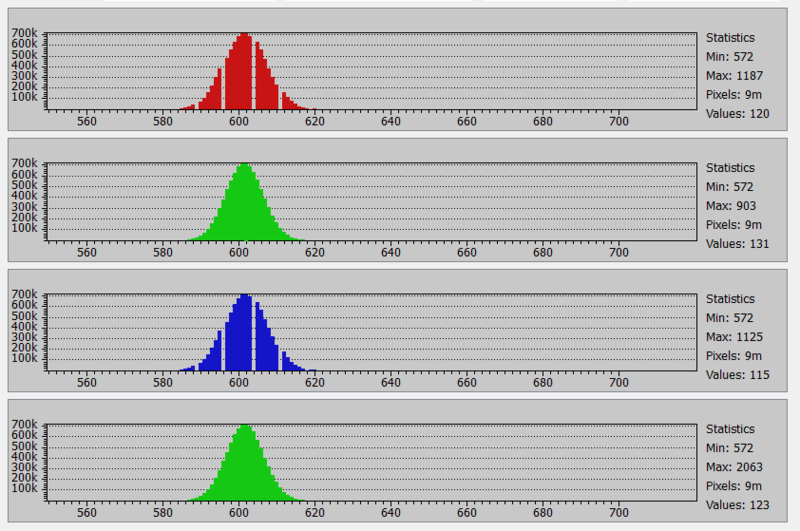 Here are a series of D810 raw histograms of a dark field at selected in-camera ISO settings. The field I chose was the back of a Sigma 50mm f/1.4 DG lenscap. To make sure it was really dark, I set the lens to f/16 and the exposure time to 1/8000 second. I used single shot mode, which makes a difference on Sony cameras, but has not had an effect on past Nikons. 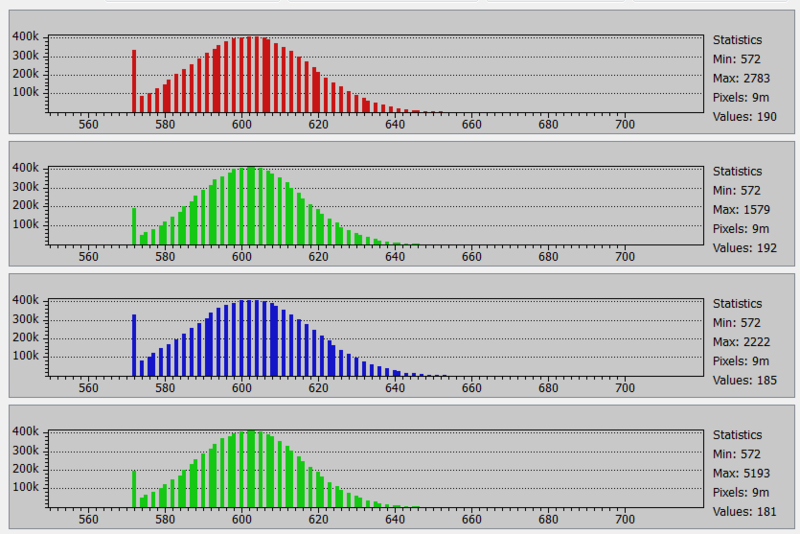 I turned black point subtraction off in RawDigger to make sure we got the whole histogram. I set the camera for 14-bit operation , and used lossless compressed raw. High ISO noise reduction was off. Nice, tight grouping. All 14 bits are present and accounted for. 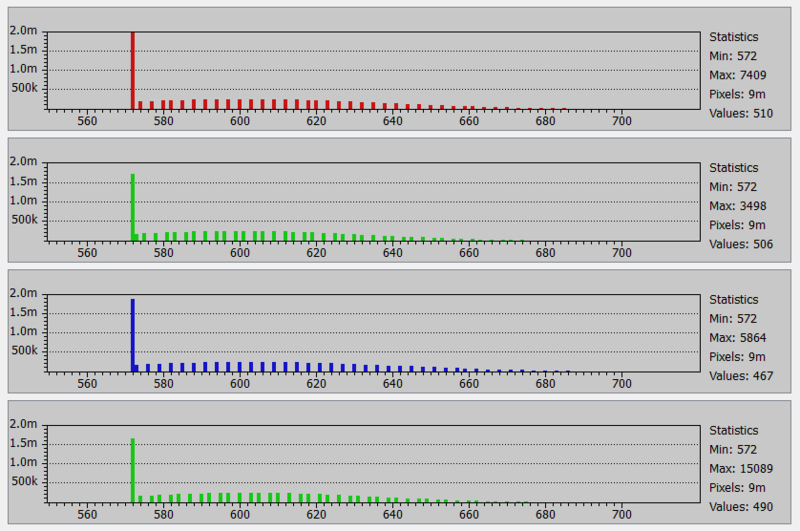 The dropout in the blue channel is because Nikon uses digital white balance pre-scaling. 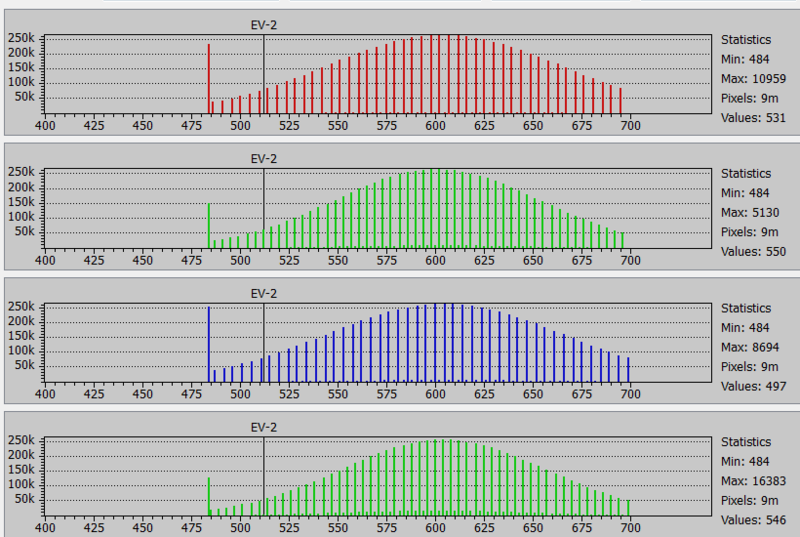 You can see that the histogram is Gaussian, and both the red and blue channels show the effects of digital white balance pre-scaling. More of same. Bored already? Just wait. 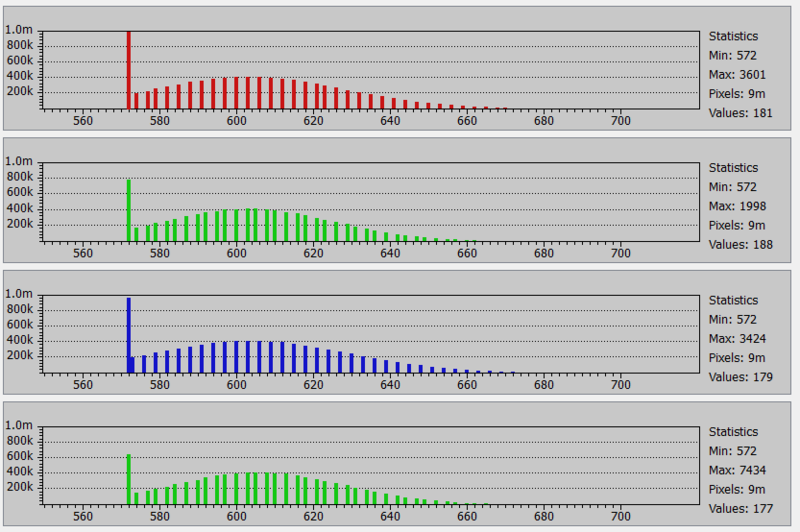 At ISO 1250, we start to lose the 14th bit, even in the un-pre-scaled green channel. Note that it hasn’t dropped out completely, though. The incomplete combing in the green channel continues. 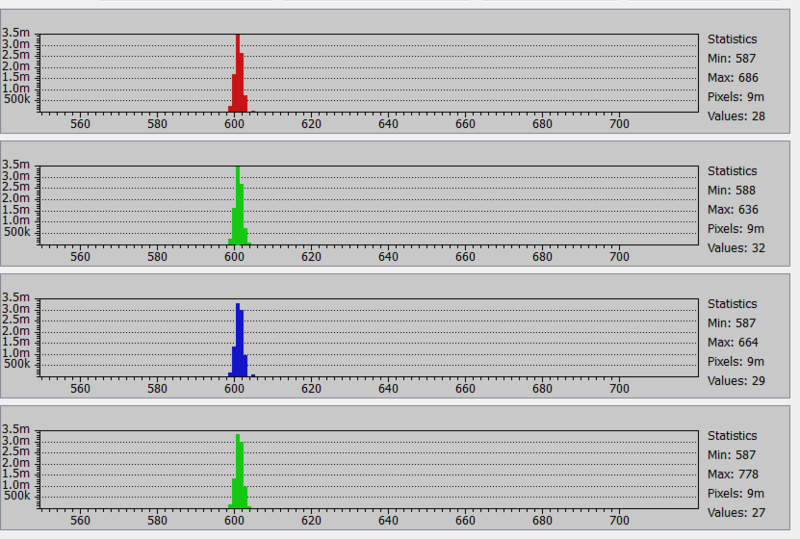 Now it looks like all three channels are clipping at an ADC count of about 540. The clipping continues, and will until the end of the series. Now we have completely lost the 14th bit. We’re starting to lose the 13th bit, and the clipping is extreme — even more than we see at higher ISOs. At ISO 8000, the D810 is a 12-bit camera. The clipping level has dropped to about an ADC count of 480. 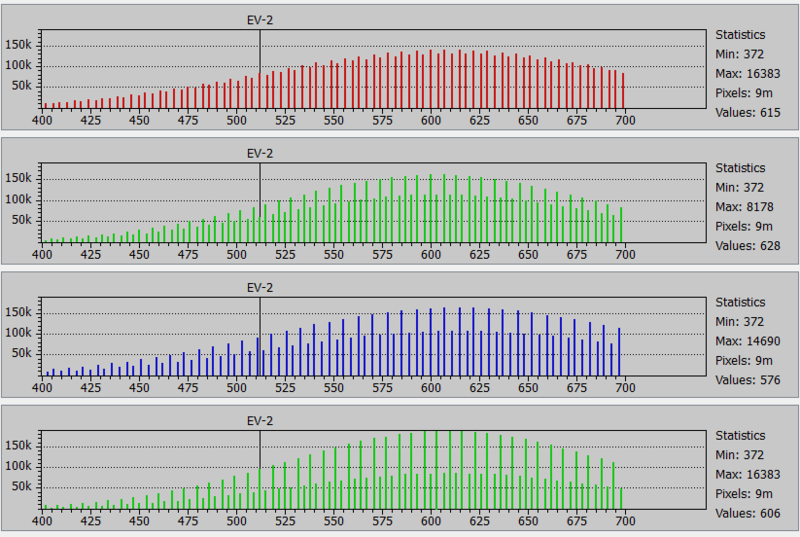 At the highest non-push ISO, we have some strange partial combing. The clipping level has dropped further. All this indicates more raw processing than I usually see on Nikon cameras. Jim, is the ‘strange partial combing’ still there if you set RawDigger to show every level on the x axis, as opposed to binning them every 5? In all the histograms in that post, the bin size was set to 1. Very nice work. Thanks for posting. 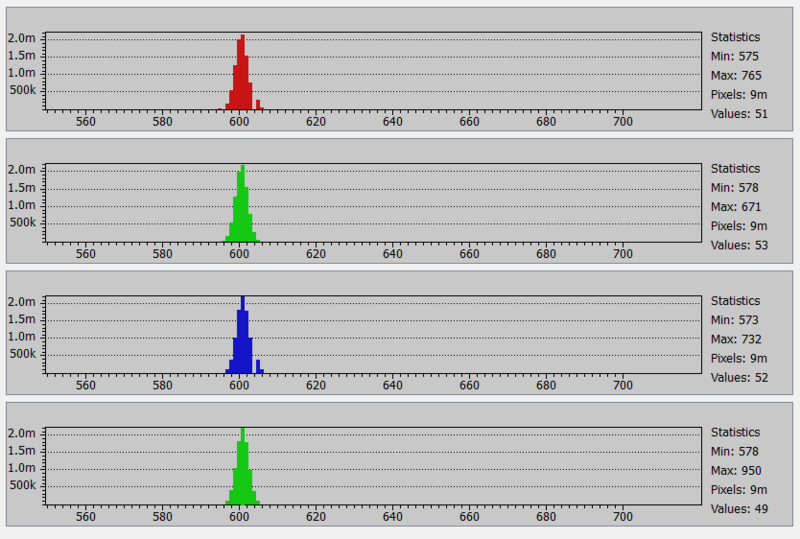 The reason there is a spike on the left side of the histogram, and then no data below that is an indication of clipping (probably at zero, then an offset added). The clipping is not as bad as the D800/e, but still there. Sneaky. Thanks, Roger. Coming from you, this kind of compliment means even more to me. I agree with you that the D810 raw processing near the black point, while a welcome improvement over the D4 and D800, is not perfect. I think that any raw processing that keeps the black point at some particular count is an indication of fiddling in the firmware, and I want my raw files raw. The D810 keeps the black point at 600. 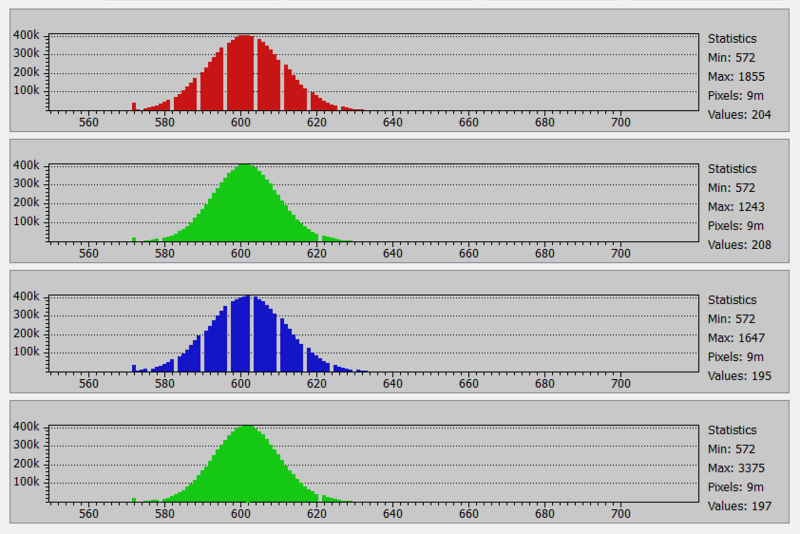 It’s interesting that the point where the histogram is chopped off varies with ISO. The Sony alpha series cameras keep the black point at 512. As an exemplar of what I’d like to see in all cameras, consider the Leica M9, whre the black point is different for every ISO, reflecting dc changes as the gain is changed, which is what you’d expect with no post-ADC manipulations. It’s interesting, and kinda disgusting, that Leica’s next iteration, the M240, went to such overaggressive black point correction in the camera that we have the green shadows problem. Very good work, as usual from you. At ISO 8000, I would think that 12 bits is more than sufficient to encode the much reduced dynamic range at this ISO. 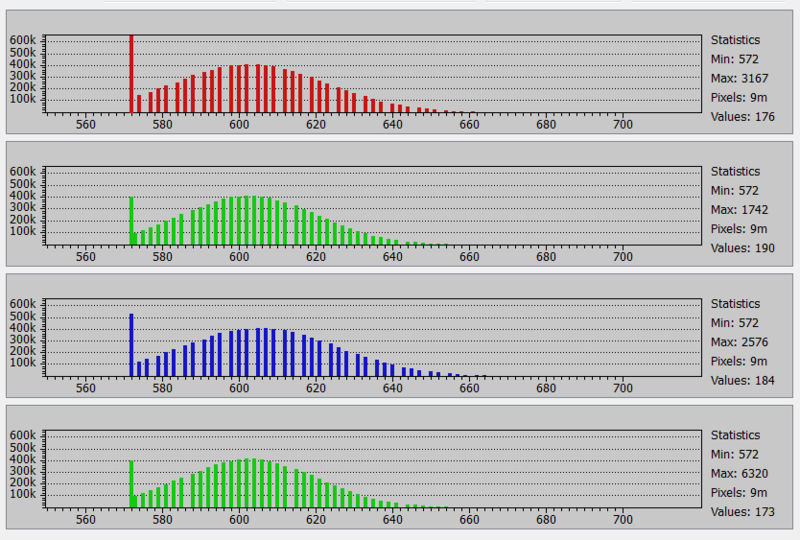 I would think that 12 bits is more than sufficient to encode the much reduced dynamic range at this ISO.